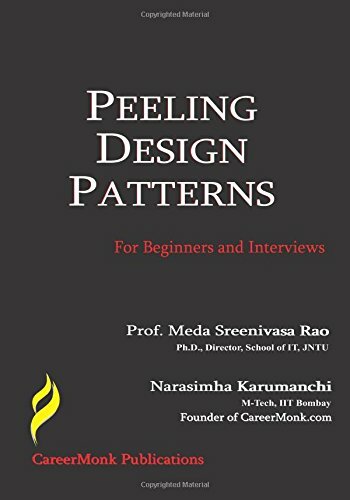 Peeling Design Patterns For Beginners And Interviews presents the subject of Design Patterns in a very easy to understand manner. It can come in handy as a reference material for working professionals, graduate and postgraduate students. Summary Of The Book Peeling Design Patterns For Beginners And Interviews introduces in a simple yet effective manner, the concepts of Software Design Patterns to even those who do not have a prior knowledge of Software Design. This book provides the reader with typical questions that can appear in a job interview. It is also a useful study guide for computer science students. The book is divided into nine chapters. All codes that appear in this book are written in Java. The first three chapters deal with the basics and cover topics related to UML and an introduction to Design Patterns. The next three chapters are about Creational, Structural and Behavioral Patterns. Towards the end of the book is a full glossary for easy retrieval of information, tips, miscellaneous concepts and interview questions related to Design. A reading of Peeling Design Patterns For Beginners and Interviews promises all those working professionals the ability to come up with improvised designs and participate actively in discussions related to Design Patterns at their workplaces. The book is also filled with real-time examples for a reader to fully grasp the concepts pertaining to Software Design Patterns. The book is written in a simple and easy manner with clear explanations. About The Authors Narasimha Karumanchi is an author and the co-founder of careermonk.com. A few of his other books are Data Structures And Algorithms Made Easy In Java, Coding Interview Questions and Data Structures and Algorithms Made Easy. Karumanchi hails from Andhra Pradesh, India. He is a holder of a B.Tech. degree in Computer Science from JNT University and M.Tech. from IIT-Mumbai. His career has spanned stints at Amazon Corporation, IBM Labs, Microsoft and Mentor Graphics. His areas of interest have been Data Structures and Algorithms, which he has also taught in various colleges and training institutes. M. Sreenivasa Rao is an Author, the Director of the School of IT, and the Professor of SIT Computer Science at the Jawaharlal Nehru Technological University, Hyderabad. His articles and papers have been published in leading journals across the world. He holds a B.Tech degree and two M.Tech degrees, as well as a Ph.D. He has nearly 30 years of teaching experience. Buy the book Peeling Design Patterns: For Beginners and Interviews from Ideakart.com.